Pau Gasol has sealed his rise to become one of the globe's greatest basketballers, not only by becoming a hit in the elite NBA but also by leading Spain to a first ever world championships title in 2006 where he won the MVP award. And his stock rose even further in early 2008 when he joined the California glamour team, the LA Lakers, in move that may lead to a first NBA title. He is gifted with rare agility for a man standing 2.15m and is at the helm of a wave of foreign players that have broken into the NBA where previously American talent monopolised team rosters. While the USA struggle on the international scene, Gasol alongwith the likes of German star Dirk Nowitzki, Serbia's Predrag Stojakovic, Frenchman Tony Parker and China's Yao Ming have given both the NBA and international basketball a fresh, exciting and more global image. Already an established star in the ever improving European league with Barcelona, Gasol made a mockery of critics that doubted his ability to adapt to the NBA when he won the prestigious Rookie of the year award in his first season with the Memphis Grizzlies back in 2001. It was the first time a European player had won such an accolade. Drafted by the struggling Grizzlies who had re-located from Vancouver a few years earlier the team reached the play-offs in 2004 for the first time in franchise history. The Olympics in Athens however were a disappointment for the basketball mad Spanish as the team failed to build on a strong start to the tournament and finished seventh, Argentina winning their first gold on the parquet. However two years later at the world championships in Japan, Spain went undefeated as Gasol led them to the final, which he sadly missed after picking up a foot injury in the nerve shredding one point victory over Argentina in the semis. In the end it didn't matter as Spain crushed Greece in a lopsided final while Gasol and his teammates returned to euphoric scenes in Spain, where celebrations ran long and hard after their historic triumph. In 2007, they were favourites to follow their world title with the European crown as the tournament took place on home soil in Madrid, Valencia, Mallorca and Seville. However the boys from Russia had other ideas and deprived Spain the win their fans so desperately wanted with a nail biting 60-59 victory in the Madrid final. Despite the defeat, Spain booked an automatic place at the 2008 Olympics in Beijing. 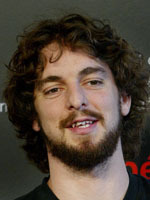 Gasol has enjoyed celebrity status since emerging as one of the so called 'Golden boys' generation (along with Raul Lopez who has since joined Utah Jazz) that lifted both the European junior crown in 1998 and then the world junior title in 1999. In his first senior season with Barcelona he helped them to the Spanish championship and a few months later was chosen third in the NBA draft, the second highest placing ever for a European. He is involved with a number of charities and has acted as an ambassador for UNICEF in the battle to fight AIDS.